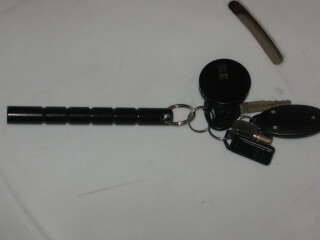 The Kubotan/self defense keychain is an amazing little key chain. I was introduced to it by my friend and teacher, Professor Arthur Cohen. It is easy to carry, looks harmless, but with just a little bit of training can turn into an incredible weapon of self defense. There are techniques for every level of the "Force Continuum". In other words there are techniques that will get a person to let go of you and they will only experience a moment of pain. But there are also techniques that can break fingers, break teeth or even worse. You have to know what is acceptable force in a given situation. A deterrent: One of the great ways to use the self defense keychain is as a deterrent. If someone unwanted is approaching you, simply whip it out and spin it like a nunchaku in a figure eight motion. Believe me, it looks pretty scary. No sane person will want to get closer to you. In fact there are many ways to spin or whip with the Kubotan key chain, just make sure you have a cluster of keys to hold on to. Or, you can hold the Kobutan and swing the keys at the assailant's face. Having a bunch of keys swinging towards your eyes is not fun. Make sure you accompany this with some loud choice words. Retired NYPD Detective Louie Balestrieri offers the following advice: "..one of the things I think every woman should carry on their person is a Kobutan with keys on it...my sister, mom and nieces all have one. I tell them to have it in their hand when out shopping and walking to their car..if they are approached, my opinion is this...when the stuff hits the fan, you use any tactic you can to survive. 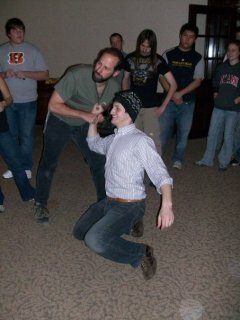 Teaching Kubotan takedown at Miami University of Ohio. Many simple and high effective techniques to use the Kubotan in self defense situations. Easy to learn and apply.